Rhyming songs for kids are a double win! They are fun to sing, and they also have tons of benefits at the same time! Rhyming songs are not just great for speaking and oral literacy skills, but they are also important for helping children learn to read. 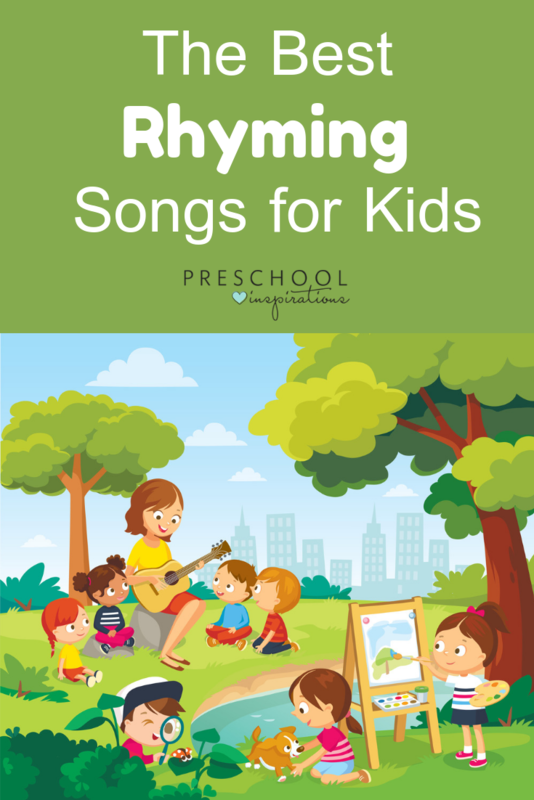 So in other words, not only are rhyming songs great for babies and toddlers, but they are also perfect for preschool and kindergarten too. To share our favorite rhyming songs with you, we’re going to share more about our favorite children’s musicians and our favorite songs of theirs! These are kid-tested and parent and teacher approved rhyming songs that you all will love singing together! Oh, Laurie Berkner, where have you been all my life?! She is so enchanting, and we all at Preschool Inspirations are in love. Hands down, she has some of the best rhyming songs for preschoolers. The tunes are catchy, the words are clever, and she walks a fine line of being 100% geared to children without being overly silly or slapstick. It’s easy as an adult to love her music too! Berkner plays guitar and sings lead vocals in the Laurie Berkner Band. When she first started playing professionally, she was in a band that played original music and found song-writing to be a struggle. Her music holds tons of musical goodness, like key changes, tempo changes, harmonies, and echoes. Young kids will probably never notice these additions, but they’re doing tons of great things! They keep the song lively and interesting, help develop critical listening skills, help learn pattern recognition, and build imagination. This is a great one for movement and action! I love to just play the audio and have the kids act out what the dinosaurs are doing. The tune is catchy, the lyrics are incredibly creative, and kids love it! (And to be honest, I’ve had it in my head for a week now and still love it myself!) See how many rhymes your little learners can find. Rhyming AND counting in one song? Sign me up! We love The Learning Station! Their songs are some of the best in early childhood education, and they teach so much at the same time. Their passions and expertise shine through their music. All of their songs revolve around the concept of “Healthy Music for a Child’s Heart, Body & Mind!” Anyone else hear that tune in their head too? A classic rhyming song! The Learning Station re-imagines it with fun animations. No matter how many times my 4-year old has heard this song, she comes running to sing along whenever it comes on! The words and number of frogs left are included on the screen. I love this “gentler” version of “I Know an Old Lady” that doesn’t include lyrics about the old lady dying. Jack Hartmann’s music is also a huge win! He’s so enthusiastic and genuine that he just draws everyone in. He has a BA in Child Psychology and a MA in Clinical Psychology. His wife is a former kindergarten teacher, and together they produce some super fun music for kids! Jack’s music is research-based and extremely educational. He’s got songs on everything from counting to phonics to planets to colors to sight words, as well as tons of brain breaks and hybrid exercise/learning songs. His library of rhyming songs are super fun! They include nursery rhymes that are sung to updated tunes, and engaging songs where he shares words and your little learners have to decide if they rhyme or not. Even older kids will love this “cool” version of the nursery rhyme! This is a great critical listening song. If the two words rhyme, you exercise. If they don’t, you freeze! Jack says two words that rhyme, then you help him out by thinking of a third one that rhymes too! When the two words rhyme, you do a dance move. When they don’t, you do a different dance move. Patty Shukla is a music educator from Florida who was playing in original bands when she was bitten by the children’s music bug! She keeps a busy schedule of live performances at elementary schools and libraries, and also records tons of original songs and videos for YouTube. Her live shows are known as “Musical PE for You and Me” for the creative ways she fuses music and movement. Her songs are chock full of preschool curriculum – shapes, colors, textures, directions, verbs, counting, using your imagination, and much more! “Rhyme, rhyme, rhyming time!” Join Patty and a bunch of friends as they see what words rhyme with the words Patty calls out. Kids probably know the song, but can they find the rhyming words? This wonderful man was once called “the most popular children’s singer in the English-speaking world” (Washington Post) and “Canada’s all time children’s champion” (Toronto Star). I’ve been a big fan since childhood – I used to play his tapes ad nauseam on my walkman during family road trips! Although not as visible today as he once was, Raffi still tours occasionally and is an active children’s advocate. He’s got a special emphasis on social media safety for young users and the need for screen limits for the very young. Cool story about Raffi – he was once approached by a major Hollywood studio about doing a film based on this song. He declined, because the film’s marketing would have included direct advertising to children, which he is staunchly against! Go Raffi! When you think of rhyming songs, this is really the quintessential one. “Have you ever had a time when you couldn’t find a rhyme?” Genius. Simple and sweet! This rhyming song has been a staple in homes for decades. Need more awesome songs for kids? Check out our library below!